In June 1820, following stagnation in the iron industry, colliery owners in Dawley attempted to lower the wages of their workforces. Violence attended the ensuing miners’ strike, but this was quelled by the Shropshire Yeomanry and the owners, realising how determined the men were, relented. The employers, alarmed at the turn of events, sent urgent appeals for help, but it was clear that the local constabulary would be inadequate. The Shropshire Yeomanry, led by Colonel Cludde, was once again summoned. By the time the Yeomanry arrived, the crowd had gathered near two industrial spoil heaps, known as the ‘Clinder Hills’, in the vicinity of the Old Park Works. As the accompanying magistrate started to read the Riot Act the miners began hurling stones and lumps of cinders at the troops. They moved forward nonetheless, and began seizing the ringleaders, whilst the crowd secured positions on the cinder hills and continued to throw material. 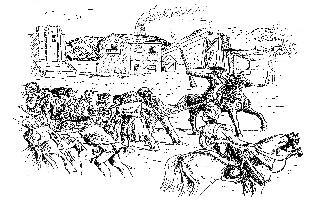 Colonel Cludde ordered his men to open fire, and in the ensuing mayhem, two miners were killed. Shocked and dismayed, the miners’ appetite for a fight evaporated and they dispersed. Of the nine captives, Thomas Palin and Samuel Hayward were later sentenced to death. Palin was hanged – despite appeals for clemency by employers – but Hayward was reprieved. The rest earnt nine months hard labour, an ironic sentence for a 19C miner. In the aftermath of the riot, many miners’ families were left destitute as jobs were lost following the damage to pit equipment. The wage cuts were inevitably forced through. Echoing the bloody suppression of working people by the cavalry in Manchester just 18 months earlier, known as the ‘Peterloo Massacre’ (itself an ironic reference to the Battle of Waterloo four years earlier) the incident in Dawley entered the folk-lore of the East Shropshire Coalfield, remembered locally as the ‘Battle of Cinderloo’. • 9 miners were tried before Salop Assizes.One miner was executed, one was reprieved. The remaining men were imprisoned for nine months.